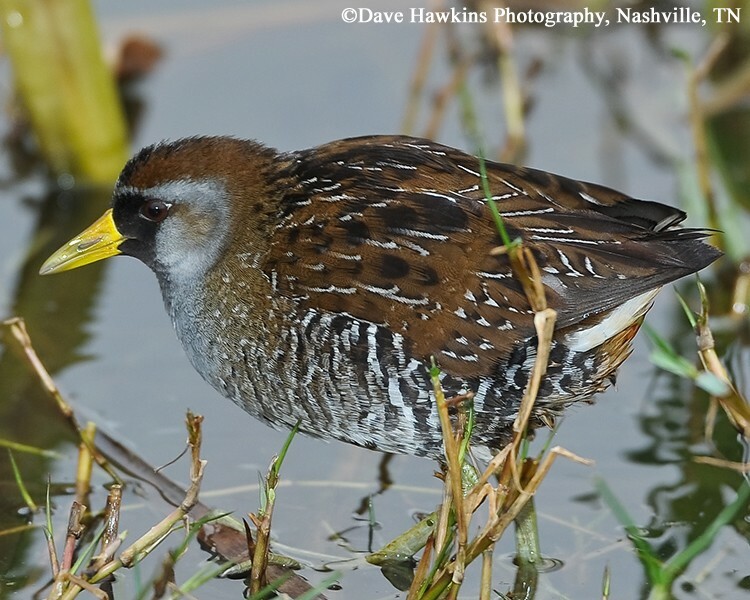 The Sora is the most abundant and widely distributed rail in North American, but in Tennessee, it is a rare nester and most likely to be found in the state during migration. It is a secretive marshbird, more likely to be heard than seen, with its distinctive descending whinny call that can be heard from the depths of the rushes and sedges. Soras breed from northern Canada, eastward to Nova Scotia, across the middle U.S., and into the southwest. They winter from the very southern United States southward into the Caribbean, and throughout Central America to northern South America. Description: The Sora is a small, slate-gray, chicken-like bird with a short, blunt yellow bill, yellowish legs, and a short tail often held upright showing white undertail coverts. Both the male and female have a black face and bib during the breeding season (March-August). Voice: The most common call is a descending whinny, which sounds like a horse’s whinny. It also gives a plaintive 2-note, plaintive ker-wee. This call is most common during spring migration and immediately after arrival on breeding grounds, and may preced the descending whinny call. Virginia Rails have a longer, thinner red bill, red legs, and never have black in the face. Habitat: Usually found in shallow wetlands with lots of emergent vegetation, but occasionally along lakeshores and wet fields during migration. Diet: Seeds and aquatic invertebrates. Nesting and reproduction: Soras are monogamous. Clutch Size: 6 to 16 eggs, with an average of 10.5. Incubation: Both adults incubate the eggs for about 18 days. Fledging: Young leave the nest within 2 to 3 days of hatching, and are frequently brooded in a specially built nest, near the original nest. Both adults care for the young for 2 to 3 more weeks. Nest: Nest building usually begins about the time the first egg is laid. Both the male and female build a loosely woven basket of available emergent vegetation, which is suspended above the water from stems of emergent vegetation, or in a clump of vegetation where the base of the nest is at or slightly below surface of water. 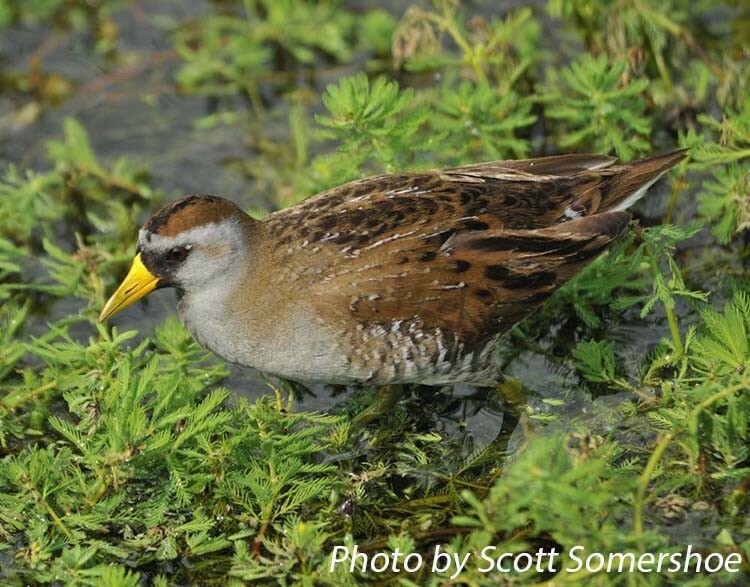 Status in Tennessee: The Sora is fairly common during migration: early April to mid-May in spring, and late August to early November in fall. It is rare in winter and very rare during the breeding season. Although the Sora is considered a game species in Tennessee it is likely seldom taken by hunters. Unlike most rails, the Sora readily swims. Although Soras appear to be weak and reluctant fliers, they migrate hundreds of miles each spring and fall between breeding and wintering wetlands. Best places to see in Tennessee: Found across the state and most likely to be seen or heard in freshwater marshes during spring migration, early April to mid-May, or fall migration, late August to early November. Standifer Gap Marsh in Hamilton County is a good place to find Sora. Melvin, Scott M. and James P. Gibbs. 1996. Sora (Porzana carolina), The Birds of North America Online (A. Poole, Ed.). Ithaca: Cornell Lab of Ornithology; Retrieved from the Birds of North America Online. Robinson J. C. 1990. An Annotated Checklist of the Birds of Tennessee. Univ. of TTennesseeN Press, Knoxville, TN.